It’s your friendly neighborhood marketer again! Familiar with Instagram posts but unsure what posting stories can do for your business or brand? PERFECT. Grab a beverage of your choice and get comfy. 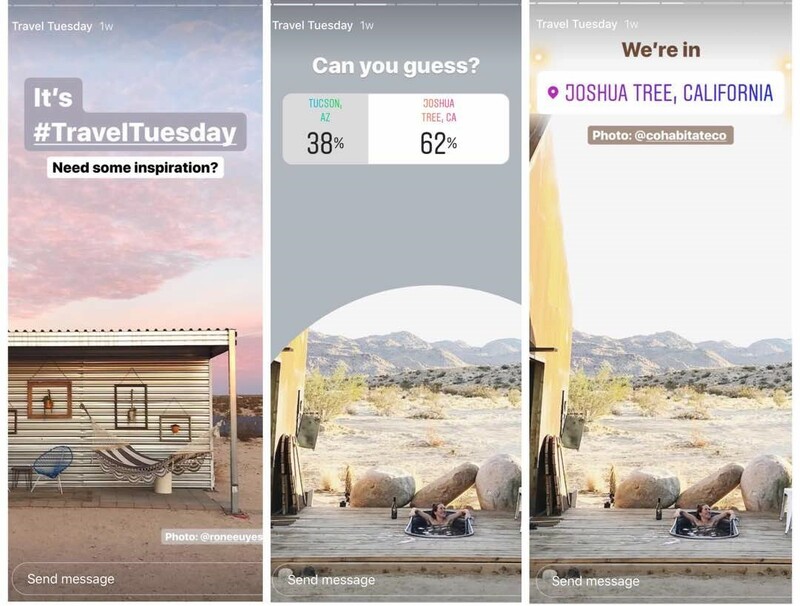 By using Instagram stories as opposed to the standard Instagram post, you can post short, captivating videos and photos that disappear in 24 hours, keep track of viewership, and connect with customers in a much more fun and interactive way! Bonus perk: it’s trendy! If your business or brand’s target demographic includes Millennials and the generations that follow, you’re going to want to interact with them on their turf. I’m nearly embarrassed about the time I spend swiping through stories each day, but I know I can’t become an expert if I don’t take notes every now and then! If you’re here and you’re already an Instagram Story expert, I might mention a few additional helping points. After all, as these apps continue to serve us updates and new features, we’re ALWAYS in student mode. Since we’re all at different levels of familiarity and comfortability with Instagram Stories, I’m going to break this topic into 3 segments: Formatting, Tools, & Programming. So without further ado, it’s off to Instagram Story School! If you’re just looking to post a simple video or photo to your Instagram Story, make sure your camera is set VERTICALLY. Instagram’s Story dimensions are 1080px by 1920px, which means your photo or video will be cropped if you don’t have your image or video set to those dimensions. Conformity is your friend… in this case. Of course, you can post horizontal photos and videos to your story, but it’s best to resize if at all possible. Keep in mind that videos must be cut down to 15 seconds or less PER post, so if, for example, you’d like to post a 1-minute video to your story, Instagram will go ahead and break it up into 4 separate videos. If the video is captivating enough, viewers will stay tuned and watch through all 4 videos for the entire minute. If they happen to open the first 15-second video and stop there, you’ll be able to see for yourself. From personal experience, this serves as a testing ground for ideas to figure out what kind of material is actually engaging to your customers. Especially if you’re in growth mode, you want to be found and followed, right? Tagging a relative location (the city you’re located in, an area concentrated with your demographic, etc.) means that your business account’s story is going to be found by users that search for it. Hashtags are a part of this conversation too. If you’re a small boutique, add #Fashion to your story if you’d like to be found when someone searches under fashion on Instagram. In that moment, you have very little time to convince that stumble-uponer to follow you, so make sure your posted content and stories are eye-catching. On the blog end of things, #TravelTuesday is a great example. Notice their use of geotagging and hashtagging, because the more exposure the better, right? Oh, and that fun guessing poll… what’s that about? Who doesn’t love to voice their opinion or thoughts on something? 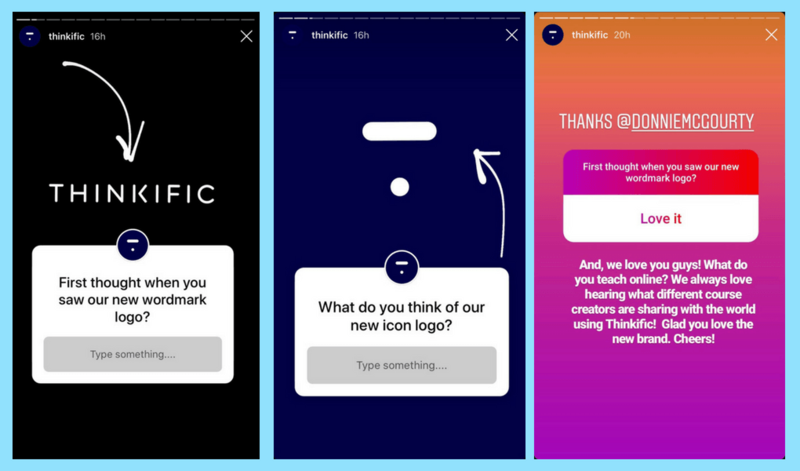 Add an Instagram poll to your story as an interactive way to check in with your viewers’ preferences and personalities. If you’re a bakery owner, try asking if people are feeling like having a chocolate or vanilla cupcake today, featuring a mouth-watering image of your cupcake creations. You may find some of those very people make a trip to you because you inadvertently reminded them that you exist and that you whip up some amazing goods. New product you need people to know about? Get creative and post a story to let them know in addition to an Instagram post! 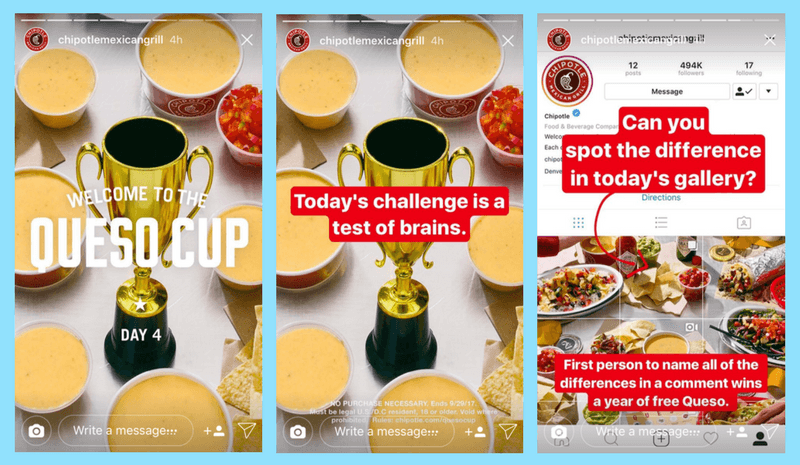 With the way Instagram’s algorithm works, the more frequently you post stories, the more often you appear as the first story option to view for your followers. It doesn’t hurt to post several in a row, creating an actual story. 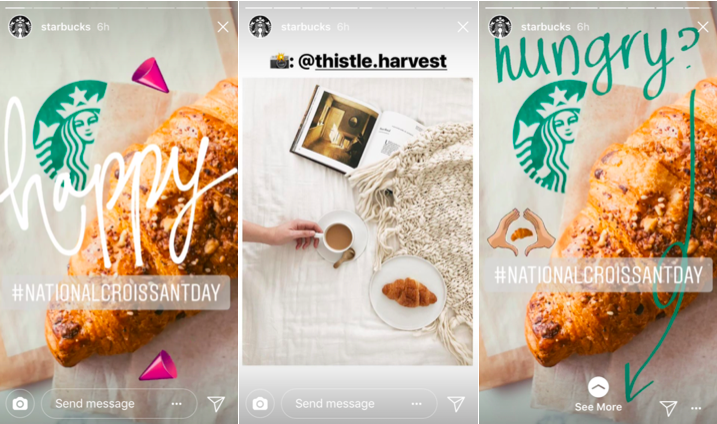 Starbucks will take any opportunity to celebrate a holiday, and they know we’ll take just about any opportunity to celebrate by going to Starbucks. Notice that the second photo is actually crediting a follower and using their picture to further their agenda and aesthetic, which gives Starbucks a bit more of a personality. So, why not go in for National Croissant Day? Again, a very temporary call to action, and very effective. I would know… I went in that day. 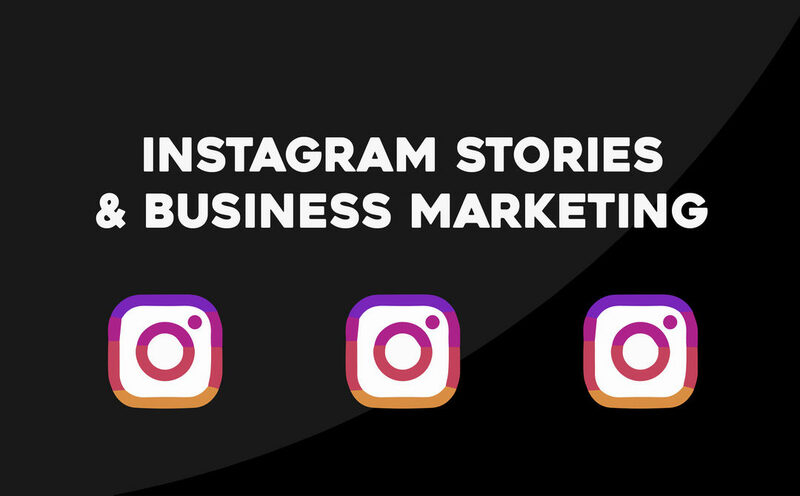 If you’re a business owner, your top priority is likely connecting with potential or loyal customers, and Instagram is giving you so many ways to do so with stories. This is arguably the warmest way to sell people without actually selling anyone at all. Need to see what I’m talking about? Boom. Not only do I love to be challenged, but I now have a ridiculous craving for queso because I can’t look away. I also want a year of free queso, so this giveaway has held my attention hostage for at least the next 5 minutes. Notice how this alone is a strategic marketing plan. I’m engaged. I’m tuning in each day for the next challenge. Of course, I suppose a burrito isn’t an incredibly tough sell, and a chance to win a year of free queso is worth the time it takes to enter. Time to throw on my comfy pants and head there next. 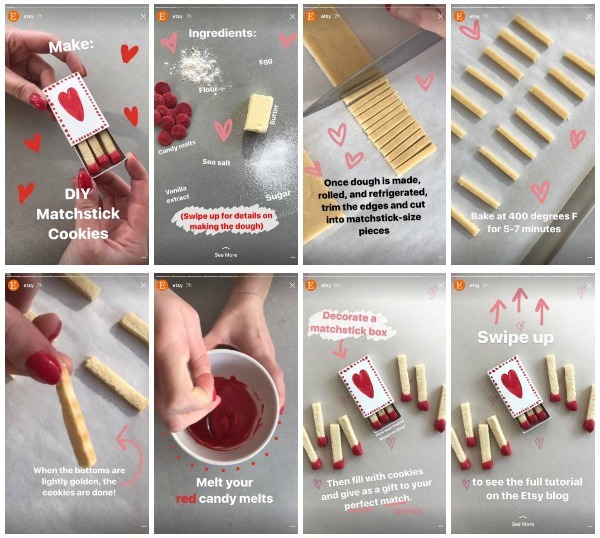 Another creative use for stories that I personally enjoy are blog-oriented DIY/How-To posts that deliver enough information and provide visuals so that I’m able to create the same thing myself at home. The trick is generating steps without taking up too much of your followers’ time. Although this is Etsy’s how-to for a cute Valentine’s treat, picture doing this for a product or service YOUR business offers. We’re not restricted to food here. Notice that Etsy only used 8 stories total for this series. That’s 2 minutes. Long enough to serve its purpose, but not so long that everyone starts to lose interest. The opportunities are endless! Disclaimer: If your Instagram page has less than 10,000 followers and/or is not verified by Instagram, you’re not eligible to attach a link that allows viewers to “See More” as shown in the last story slide above. This is a great tool to acquire once you’ve proven that your brand is “insta-worthy” as they say. It’ll allow you to quickly connect viewers with a link that will redirect them to the page you’d like for them to land on. Well, class is dismissed! I hope you’re able to apply some of these fun features to your Instagram marketing plan if you haven’t already. Remember to show off your creativity and personality as a brand, and have fun with it! 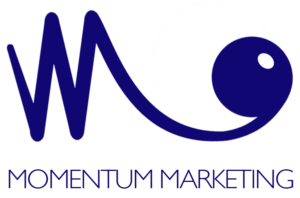 As always, those of us at Momentum Marketing are happy to help lead the way and answer questions as they come. Dounia is currently the Business Development Manager at Momentum Marketing Consultants, with a background in English and Creative Writing. She almost always manages to make her blogs about food and takes pride in bringing digital marketing and food together.